Social studies is more than lectures, documentaries and boring facts; it involves studying world cultures, tumultuous times in history and the way people have lived and interacted for centuries. There's nothing boring about that. Encourage your kids' curiosity and help them develop a love of social studies by moving beyond the facts, documentaries and lectures and helping them experience the past and the current world around them. There's nothing wrong with reading a book about history or watching a program on the History Channel, but children often find it boring. By getting out of the house, you can help children experience history and other cultures firsthand. 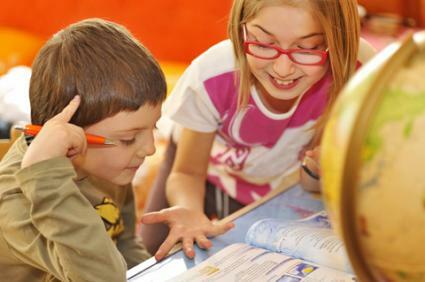 Build geography skills by drawing a map and sending kids on a treasure hunt as they learn about different features in your town or develop basic map-reading skills. Get out a map and follow it to get to a special landmark, such as a playground, a toy store or an ice cream shop. If you're taking a trip, help children plan the trip, allowing older children to even plan rest stops or find points of interest to stop at. As you travel, take an extra map for children to look at and encourage them to look for ways the new destination differs from the place you call home. Visit as many natural history, national hall of fames and other museums as possible. If you want to study social studies at home, make it as interesting as possible, by allowing children to explore cultures and time periods that interest them. If your child could go anywhere in the past or present, where would he go? Have your child choose a place and a time period, then conduct research to help plan the trip. What clothes will he need? How will he get there? Are there any safety measures he will need to take or customs he should know? What places would he like to visit there? What people would he like to meet? Encourage your child to choose a culture other than your own and learn as much as possible about it. Find pictures of the clothing, arts and crafts and homes of the people in the culture. Look at what the majority of the people in the culture do for a living. Find a few recipes and try your hand at making some of the culture's more popular dishes. What would your child do to make the community a better place? Encourage your child to take on the role of a politician and brainstorm ways to make the community better. It may be something small, such as building a new playground for children or something larger, such as bringing in more business or reducing the overall amount of pollution in the community. Have your child write a letter to the editor of the local newspaper, city hall or a congressman with the idea. Your child may even be inspired to take a bigger action, such as raising money for the community or setting up a community event. Books, toys and games can help make social studies more interesting for children. They can feel as if they are living in history or another culture as they play games, interact with characters in a book or engage in creative play with social studies based toys. The American Girl Series is comprised of books representing girls from different periods in American history. Along with the books, girls can purchase dolls, play sets and movies to help experience the history. The Magic Tree House Research Guide series contains multiple non-fiction books about history written with kids in mind. Many fairy tales, such as "Cinderella" and "Little Red Riding Hood" have many different versions written to reflect different cultures. National Geographic for Kids is a magazine that introduces kids to different cultures, geography and history. The Oregon Trail takes kids on an adventure in pioneer days as they struggle to survive the trip out west. Where in the World is Carmen Sandiego?, once a popular TV show, has children learn about history as they try to find Carmen Sandiego and stop her crime sprees. GeoDice by Geotoys is a game encouraging kids to learn their countries and capitals. Pit teaches kids and adults about economics and trading as they attempt to trade commodities to corner the market. Name Chase tests kids' knowledge of historical figures, giving teams four clues to guess who the figure is. Talking globes, such as Vtech's Spin and Learn Adventure Globe, helps kids learn about geography and different cultures around the world. Puzzles, like the Melissa and Doug USA Map 51 Pieces Floor Puzzle, encourage kids to learn where cities, states and countries are located. The more interactive and entertaining you make it, the more kids will become interested in social studies. They will also begin to make connections between their own lives, the history the read about and the cultures they encounter. These lessons will prove invaluable as they experience life, teaching them to be tolerant and to learn from the mistakes of the past.